Laryngopharyngeal Reflux (LPR) or sometimes known as silent reflux is a condition where acid comes up from the stomach and burns/damages the throat. There are a host of symptoms, but the main issues revolve around problems with the throat. 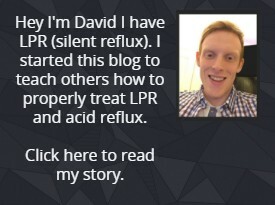 Usually with LPR you won’t have any heartburn that typically comes with reflux and GERD (Gastroesophageal reflux disease) and that’s why sometimes LPR is also referred to as silent reflux as you don’t have the typical reflux patient symptoms. There are a selection of different things that can cause LPR. Also because of this there are a selection of ways to solve the problem depending on the root cause. Though it tends to be some are much more common than others. Doctors and physicians alike will often assume reflux and prescribe anti-acid tablets like PPI’s (proton pump inhibitors). This can help certain people and for others may not help at all and in fact hinder. Below I am going to cover each of the different options that can cause LPR with advice on how to tackle each of the problems along with treatment advice and help to diagnose LPR with all the LPR symptoms explained. The number one cause of LPR is because of a weak or malfunctioning sphincter. There are a few sphincters that can have an effect, I cover each of them below. 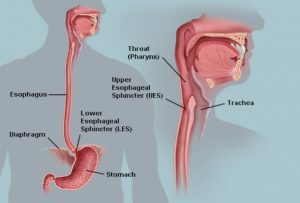 The sphincter that most likely will be the one causing you the problem is called the Lower Esophageal Sphincter or LES for short. This sphincter is directly above the stomach and opens and closes as food passes through from the esophagus. The problem occurs when the LES is weak or relaxed when it should be closed and tight. This causes the stomach acid to reflux up into the esophagus which then ends up reaching the throat where the main problems of LPR arise. Unlike most muscles in the body the LES doesn’t get stronger with more usage but in fact gets weaker. As you know with most muscles if you overuse them they can get sore and stop working properly – this is basically what can happen to an overworked LES. A LES that is overworked often means a LES than needs to relax more because of this overworking and therefore means more reflux and LPR symptoms. This is because the LES is not creating a barrier against reflux as it should. Things like overeating and eating shortly before bedtime put more pressure on the LES and this can cause the problem over years of constant overworking the LES. The best way to treat a malfunctioning LES is by changing your diet. There are a host of foods which are known to make the LES weaker which in turn will make you reflux more not because of more acid but because of the LES being open when it shouldn’t be. The common foods that you should be trying to avoid are drinks with caffeine particularly coffee and soft drinks, chocolate, fatty foods (fried foods, cream, ice cream, bacon etc). Coffee and chocolate both contain methylxanthine which makes muscles relax more and this in turn can affect the LES and lower the pressure in the stomach. Also foods that are high in fat have shown to take longer to digest and take longer for the stomach to empty. This means more acid in the stomach for longer which will make the LES work for longer and harder which we want to avoid. The LES is not like a traditional muscle that strengthens when it’s used more – it needs the time to be worked less in order to properly heal and return to its normal function. Also avoiding foods and drinks that are highly acidic would be advised. Things you should avoid – alcohol, citrus fruits, tomatoes, mint and all carbonated drinks. If you are prone to eating big meals this puts more pressure on the LES because the stomach becomes more full or overloaded and at some point, will struggle to keep the food and acid inside the stomach because of the stomach being too full. It can also have the effect of tiring the muscles after years of eating big meals for example as I mentioned before. So therefore, eating smaller sized meals with about the amount of food the size of your fist would be more appropriate. You can still eat as much as you normally would, but it is better to split amongst more smaller meals instead of few larger meals. The second option is surgery and should only be considered among people who have tried all other options. There are a selection of different options available but 3 of the more notable and successful options are called Nissen, Linx and Stretta. I will cover each of them briefly below. How the Linx surgery works is basically they place a magnetic band around the LES area of the stomach. This magnet goes around the LES and tightens the LES to prevent the acid and gas from refluxing back up into the esophagus. When you swallow food the magnet opens and it allows the food to pass through and once the food passes into the stomach it will retract which will help keep the LES tighter and prevent any reflux. The upside of this procedure is that it is easy to remove if any problems arise or if you don’t get the benefits you intended. How Nissen works is basically part of the stomach is wrapped around the LES area which in turn will tighten the LES and theoretically lower the chance of reflux because the LES will be tighter. The clear downside is this is the most permanent of the 3 options. Finally, the last option is called Stretta. How it works is the Stretta system delivers radiofrequency energy at the LES. It is meant to remodel and improve the muscle tissue. The muscle around the LES area or just above should be thicker which will mean increased barrier against reflux. This therapy is minimally invasive, and you should be able to continue back to normal the following day. This is a drug which can be used to lower the number of times the LES relaxes therefore reducing the number of times you will reflux. Though it is worth mentioning that there are a host of side effects such as drowsiness, mental moods, hallucinations just to name a few. Check out this study about it’s benefits here. Most people know about melatonin for its use to help with sleep. During a study where patients took melatonin for reflux (GERD) alongside a commonly prescribed PPI and also without the PPI to see its benefits if any. It was shown in the people that did the study had lesser heart burn, lesser epigastric pain and importantly more pressure in the LES. So, it shows the it can directly help with LES pressure as that appears to be the main reason the reflux incidents with patients where much reduced after taking melatonin and it definitely makes it something worth considering. The UES is the sphincter between the throat and the esophagus. When it comes to reflux it is the last barrier before the acid gets to the throat. The problem with the UES is that is really isn’t there to prevent against acid reflux and often won’t offer much of a barrier as you would like. Technically speaking if the UES doesn’t stop the acid then you will develop LPR symptoms. The LES and the esophagus are made to tolerate high levels of acid whereas the UES typically doesn’t fair as well when acid stomach comes its way. The best way to help the UES is by following a lower acid diet, avoiding acidic foods like I mentioned in the diet section in the LES part above. When you avoid these foods, this will allow the UES to heal and recover and should in turn help it come back to its normal function. The predominant research on sphincters has been done primarily on the LES as that’s where doctors and physicians alike assume the main problem arises. Therefore, there is little to no research on the UES in regard to reflux even though it may pay a very important role with LPR. The same applies to LPR as there isn’t much research on it when compared with GERD where there are countless studies. The final Sphincter is the Pyloric sphincter. It is the Sphincter between the stomach and the intestines. Once food has been digested it will pass through it into the intestines. 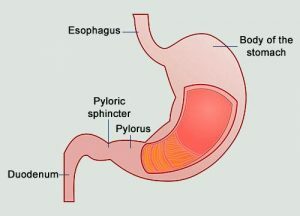 When a Pyloric sphincter doesn’t function correctly bile which is usually found in the small intestine can end up passing up through the stomach and then giving reflux symptoms and LPR symptoms. This is called bile reflux. It can also have the affect that if the Pyloric sphincter is stronger than the LES and the pressure is building in the stomach one sphincter has to give and that usually happens to be the LES – when that happens you get the reflux effect. Typically, the same things that will benefit a LES will also benefit a Pyloric sphincter. Physicians and doctors will often prescribe a PPI and it can help though I would personally recommend following my diet advice the same as for the LES instead. There hasn’t been that much research on the Pyloric sphincter and thus we will still need more knowledge and information to be able to draw a more accurate conclusion. Though as I have mentioned following a low acid diet will often help symptoms for both. If you have went to your doctor or physician about your LPR. You will have likely been prescribed PPIs (proton pump inhibiters) or an H2 Blockers. A few which I have listed below. Both of which are used to lower the amount of acid production in the stomach with PPI’s being the most potent acid blocker. These tablets are used to lower the acid in the stomach. For some people they may get some benefit from taking these tablets but often this effect will not last for long. For most people especially, people will LPR they often won’t get any benefit. The reason for this is because these tablets don’t tackle the problem directly. This doesn’t stop the LES from opening and you from refluxing. While the acidity in the stomach may be lower from taking these tablets it just isn’t targeting the main problem which is pepsin which I will cover in the following section about treating pepsin. There have been studies done to test the effectiveness of PPI’s for treating LPR which ended up showing that PPI’s offer no benefit to someone with LPR. Check out the study here. This is something I want to personally highlight because I myself took doctors advice for taking PPI’s for LPR. I took them for 2-3 years with little to no benefit. Almost all doctors and even so-called specialists in the gastro area all would prescribe PPIs, if that didn’t work which happened for me again and again they would try another variant or up the dosage. I am sure plenty of you have a similar experience when it comes to being prescribed PPI’s and you can relate to my story. The reason for me pointing this out is that most medical experts simply don’t know or have the knowledge about LPR and they will often treat it as if it where GERD. This treatment is completely wrong, and I would proceed with caution when taking advice from someone who prescribes them so readily to you. Part of the problem with this is that LPR is a somewhat new problem that has only come around in recent years. The second problem being it is often overlooked and treated as if it where traditional heartburn or GERD as I mentioned. There is a good chance some of you are currently taking PPI’s with little to no success for LPR. While I would advise you to stop taking PPI’s you must taper of them slowly. I myself learned the hard way going from taking 40mg per day to 0mg which gave me tremendous reflux, so much I ended in the emergency room a couple of times. This happened because of a rebound like effect. The problem with this is people who try to stop the tablets on there own get this massive amount of reflux if they stop taking them going from 100% dosage to 0%. They will then end up thinking “I need these tablets to control my reflux” – but in fact this is simply the rebound effect. There have been studies done to show this rebound effect from people who are healthy and don’t even have any reflux problems – once these healthy people stop these PPI tablets they end up with the reflux symptoms that they never had before! Here is the study. If you are currently taking them with no benefit I would advise to taper of them slowly. For example, I would take 2 20mg tablets a day for a total of 40mg per day. I would want to lower to 30mg per day 20mg in the morning and then 10mg in the evening both before meals. I would do that for maybe 1-2 weeks then continue to lower it to 10mg & 10mg per day and then finally 10mg per day. If you aren’t able to get tablets in a lower dose, I would recommend splitting the tablets yourself. The PPI’s usually have some balls inside each tablet, so you can roughly split it yourself if needed. For me it took me about 1 month to tamper my dose from 40mg to 0mg. Please remember when you lower the dose you may get a slight increase in reflux, but this will only be short term. Lower the dose once you feel settled at the current dose – the longer you have been taking PPIs and the higher the dose the longer you may need to taper off them, but I would suggest 4-8 weeks’ time. If you do plan on doing this I would highly recommend doing this alongside my treatment advice below in this guide. Pepsin is one of the digestive enzymes that the stomach produces and is used primarily to help break down proteins. After research from some experts in the field it has shown that people with LPR have this pepsin present in the throat area whereas with a typical person this pepsin is not present. The clear problem with this is that pepsin is used to digest proteins so when it comes in contact with the throat it basically tries to digest it. This is where you will usually get the problematic symptoms from. The thing with pepsin is that is only becomes activated when in contact with something acidic. This is because its meant to be in the stomach and when acid is produced to help with digestion it will become activated which is exactly the point of it being there. When it is in contact with something of a pH of 6 of above it will start to become inactivated and will stop its function and therefore in an LPR sufferers case will stop/help the symptoms. On a pH scale 7 is neutral with everything below being acidic and everything above being alkaline, the lower the more acidic and the higher the more alkaline. At a pH of 6 is when the pepsin starts to become active though its activity is still really low at about 10% and shouldn’t bother you much if at all. 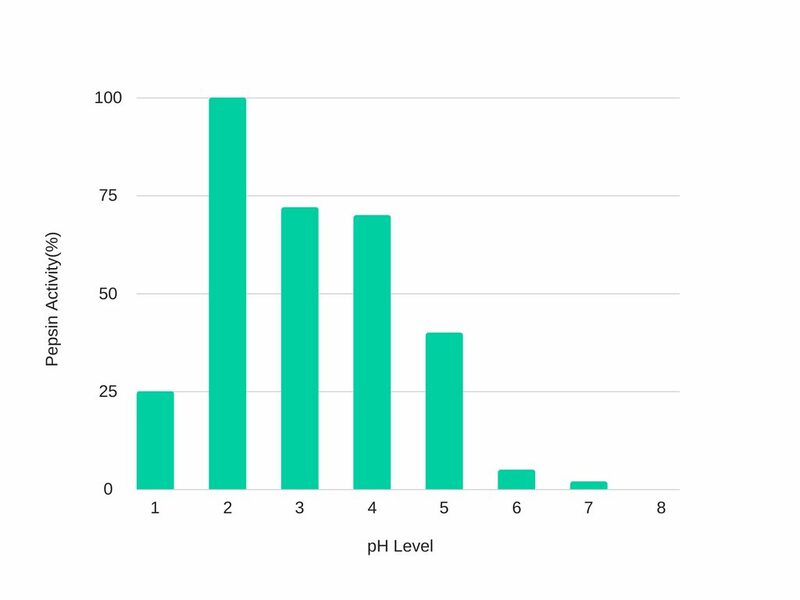 At about a pH of 5 is when it really starts to become more active to the point you don’t want – it’s about 40% activated at pH 5 and progressively gets more active as things get more acidic. Check out the graph below for reference. Though with somewhat limited research it has been shown pepsin can lay dormant in cells for 1-2 days’ time so if you refluxed the day before then ate something that was acidic the acidity of the food merely passing over the pepsin that was in the throat before would reactivate it and give you your LPR symptoms even if you never refluxed. The best way to treat pepsin is to simply lower the acid of the foods & drinks you consume. Foods that are lower in acidic level activate the pepsin less if not at all which then will lower and vastly help your symptoms. It’s clear that pepsin reactivates mostly from foods and drinks with a pH of 5 or less. If you lower the intake of foods/drinks like this, it will also stop the pepsin becoming reactivated and will therefore heal and help your symptoms. It should also help with the direct reflux because of the lower acid intake so its sort of a 2 in one if you follow this diet. There have been a couple of books that directly follow this principle of simply following a diet with foods and drinks with a 5 pH or higher. One of my recommendations for this is the Acid Watcher Diet book where he directly advises why following this diet is effective and the foods that fit the bill. Water that you usually drink would typically be around the pH of 7 or about neutral on the pH scale. Alkaline water is water with a pH of higher than 7. 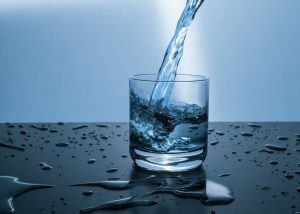 Water with a pH of 8 or above has been shown in studies to deactivate pepsin, so when you drink it, it should help deactivate any pepsin in the throat that it comes in contact with. If you are doing this step alone without following the diet you still likely will be reactivating the pepsin so I would only advise to do it if you follow the diet alongside it. In that way you will get the biggest benefit possible. There are a few ways you can get alkaline water with a pH of 8 or higher. The best way is to get water that comes from the source and has the higher pH of 8 or more. Options like these would be the best and most natural choice. The 2nd option is adding drops to your own water to make it more alkaline. Drops like these one from Alkalife can be added to your water to make it more alkaline. The 3rd option is to add baking soda to your water. You simply mix it up with your water to make it more alkaline. This is clearly the worst option because of the amount of baking soda you would be consuming but it should be okay for short term usage. A final thing I know you are thinking is how to measure the pH of your water to know you get it to the right level. Well the common thing for testing is pH is pH strips though through my own experience pH strips aren’t that accurate and can leave you somewhat guessing at your pH level. I would instead recommend getting a digital pH meter like this one. Using a digital one will give you a very accurate reading, so you know you are getting the right level that you want. This meter can also be useful for measuring the pH of other foods and liquids if you plan on following the diet of 5 pH or higher as you can then test the pH of things if you are unsure. There is a theory based the stomach having too little acid and this may seem confusing to readers as they are usually treated for having too much acid instead of too little acid. As someone gets older the body produces less and less acid. This is part of the reason it is said people develop reflux when people get older. This is the idea of author Jonathan Wright who wrote a book directly about that topic called – “Why Stomach Acid is Good for You”. In his book he talks about why you need high acid in the stomach and why you should avoid PPI’s at all costs. The question that is relevant to us is can this affect people with LPR? The answer being that there is no evidence and research to support that low stomach acid causes LPR and from people’s experiences for the most part this seems to be the case mostly. Though there are a few rare exceptions where it has helped people through taking a supplement called hydrochloric acid(HCL), this is the acid the stomach uses to break down food and when you take it you are basically supplementing the acid in your stomach. There is a test called the Heidelberg stomach acid test that can be done to measure the acid level in your stomach to see if you are stomach acid level isn’t acidic enough and if you should consider taking this supplement. For this test you swallow a small tablet, and it will measure the acidity level in your stomach and it will pass through. This way you would know more accurately if your stomach acid level is too low and should consider takin the HCL supplement. Though keep in mind for most people with LPR this won’t be the right option, but I wanted to make you mindful of it. When food enters your intestines, this food starts to ferment. Usually when someone has SIBO that means they have too much gas that is being produced. This gas can lead to pressure build up over time and the gas sometimes can end up passing up back through the stomach giving you reflux and gas. The problem is this gas can contain the pepsin that we mentioned earlier, and this can give you the LPR symptoms. There is little to no research done to show if there is a direct correlation with LPR and SIBO, though from my own knowledge and research it’s unlikely this will be your main cause though there is definitely a chance it could be. If you find yourself burping a lot or have IBS alongside your LPR symptoms, then considering SIBO could be worth your while. There is a good book called Fast Tract Digestion that covers the direct relation between SIBO and heartburn and LPR like symptoms. In the book he discusses exactly the science behind it and exactly how it works, then he discusses exactly the kind of diet you should follow to help SIBO. As far as testing to know if you have SIBO. There is a test that is semi reliable to test if you have SIBO. It’s called the lactulose test which is a breath test that will measure hydrogen in the breath after consuming some lactulose. Someone with SIBO will have more hydrogen in their breath after taking it then someone who doesn’t have SIBO. Sore throat – this is probably the most general and common symptom of the bunch, and generally speaking what most people with LPR will have. Need to clear throat – if you feel the need to constantly clear the throat try to stop doing that, when you do it constantly throughout the day it can irritate the throat further, instead of clearing try to take a sip of water or these lozenges. Once you start to do it less often you will slowly stop doing it over time. It will help the throat heal faster along with my other treatment advice. Excess mucus in throat – The excess mucus is often because of the throat trying to protect and heal itself and is totally natural. Try to sip water when needed or lozenges like these to keep the throat clear. Chronic cough – Just like with the need to clear the throat you might find yourself coughing frequently, try to not cough as much as it can further irritate the throat from doing it frequently. Keeping the throat moist with water/tea(read advice) below and lozenges my recommendation. As I have mentioned drinking water and taking these lozenges are good options for some relief. A couple more options I would recommend are teas, the 2 options that follow all the guidelines are chamomile tea and the other being marshmallow root tea. Chamomile tea will soothe the throat thanks to having anti-inflammatory properties. Marshmallow root tea is your best bet because it not only has the ability to coat and heal the throat, but it has the same effect of the whole digestive tract and has been shown to aid digestion and help reflux as well. As I mentioned in the “too much acid” section above LPR is most commonly treated with PPI’s which have been shown to NOT help with LPR thanks to studies that have been done, read more about PPI’s etc. in the section above as mentioned. Luckily for us there are other options out there which can be used to treat LPR and actually give you relief which are below. The first 2 recommendations are what I would advise you get started with as soon as possible. After the first 2 options I have listed a host of other things that can also help you even further! Gaviscon advance is a great thing that will definitely help reduce your LPR symptoms and while it won’t fix the root cause of the problem it will help give you relief while you work on solving the actual root cause. The second important part of my advice is to follow a diet alongside taking the Gaviscon advance, the diet would be aimed at tackling the root cause while Gaviscon will help your symptoms and should aid healing as well. The important thing to note when buying Gaviscon Advance is that you buy the UK version. Unlike the US version the UK version has different ingredients and most importantly the has the ingredient (sodium) alginate. Alginate is something that is extracted from seaweed. The thing with alginate is that it produces a foam on top on your stomach contents which helps create a barrier like effect which helps prevent against reflux. This foam is also great for filtering things like pepsin and bile which I have talked about earlier in this article and are some of the main causes for LPR. There was a study done to test the effectiveness of Gaviscon Advance when treating LPR. The study showed that taking Gaviscon Advance(UK version) had a significant positive effect on LPR – proving that Gaviscon Advance(UK version) does help against LPR. The best way to take Gaviscon Advance is 30 minutes after meals as this is when the stomach enzymes and digestion are most active. You can take it before bedtime as well if needed. To purchase the UK version if you are in the US is quite simple, it is available on Amazon here. The type of diet I recommend is avoiding foods with a pH of 5 or below. As I mentioned in the section above about pepsin, it becomes reactivated more at pH 5 and below. So, if you avoid eating foods and drinks with a pH of 5 or below you aren’t reactivating the pepsin in your throat and thus should directly help with your symptoms and healing process. For a complete diet plan that is tailored to LPR check out my Wipeout Diet Plan here. Someone who is overweight is more prone to LPR. If you have more body fat around the stomach area this causes there to be more pressure on the LES which often means more likelihood of reflux and LPR. When you are sleeping you are more prone to reflux and LPR because you don’t have the advantage of gravity helping keep the acid in the stomach. Using a wedge pillow is the best way to elevate your head when sleeping and it can help with nighttime reflux. I would recommend this wedge pillow. Someone who has lots of stress/anxiety in their life is more prone to have reflux symptoms. If you find yourself stressed or anxious often this could be making your LPR worse or even bringing it on in the first place. Doing meditation daily could help with this, also drinking chamomile tea which helps with relaxation could be a good idea. The best way to help with worry and general stress is to have a overall mindset change. For me personally after reading this book called – “How to Stop Worrying and Start Living”, it really helped changed my mindset and definitely helped with my nervous tendencies and overall mentality. If you are someone who is worried or stressed etc. I would recommend giving this book a read it could not only help your LPR but also your whole body and mindset. 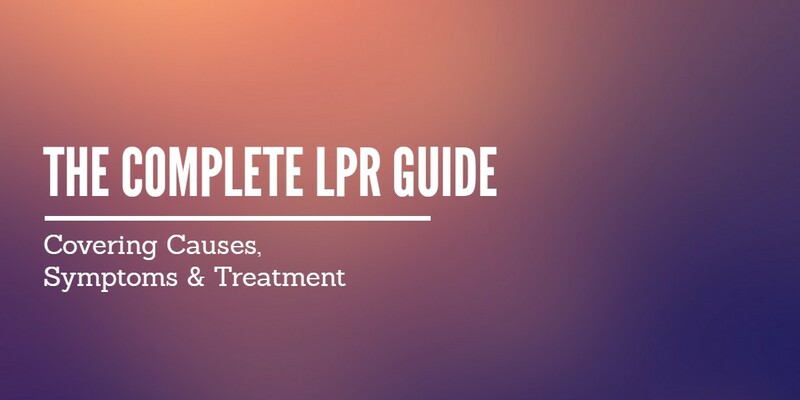 I hope this guide has offered you the insight and guidance you need to get started with properly treating and addressing your LPR. If you have any questions or concerns, please feel free to leave a comment below or contact me using the contact page. Best of luck on your healing journey and remember to stay positive! Thank you for this extensive guide concerning LPR. I have a lot to think about. Is there a connection between issues of the tongue, such as burning and terrible taste and LPR? Yeah there is most likely a connection. It’s most likely acid if it’s due to acid reflux as I presume. If that is your only symptom though it could be something else possibly. Read my article about burning mouth syndrome here for more information. You are most welcome Maggie. I am glad I could help. I hope it works well for you. Wow, this is such a thorough description of LPR and measures to resolve it. You never think about LPR until it rears it’s ugly head again and then it’s all you can think about. David, first let me wish you on behalf of most readers here a Happy New Year and an LPR free one. Second, thank you for taking the time to research and share with us GERD/LPR sufferers. This is my first 2 weeks with what looks like LPR (had intermittent bursts of AR since 2008). I have been taking omeprazole 20 mg once in the morning for 14 days now. I will reduce and let you know. It all started after a virus induced bronchitis and coughing a month ago. I also suffered a couple of horrible episodes of laryngospasms. Maybe this could help some of the readers. An upper respiratory infection is correlated with a flare of GERD/LPR. I am guessing the excessive coughing would add strain to the whole mouth/stomach tract causing a lot of the sphincters you mentioned to weaken. It could also trigger a hiatal hernia. Maybe you (and the readers) can share what triggered the initial symptoms. If you accept donations or contributions please let me know. Hi Bassam thank you and happy new year to you also! In terms of LPR I always recommend healing it naturally through diet if possible. It is generally the most effective way to heal it. Typically PPI’s are prescribed and for me also I too took them for 1-2 years with little to no benefit. Generally speaking stopping PPI’s will do more good than harm especially in the long run. Also as you mentioned yes there are some possible correlations and ways people have mentioned to me of how LPR can come about in the first place and it seems there is no common cause but a host of potential causes for different people. For me personally I believe it was because of taking anti-inflammatories and anti-biotics which started my stomach problems but later down the line when I developed LPR symptoms I believe it was due to stress. My point being that there are a host of potential causes just like the one you mentioned with a respiratory infection. I’m glad you appreciate the information, I’m happy to know I can help people like yourself learn more about LPR and how to help it. Thank you so much. I have researched LPR for a year now. This is the most comprehensive and informative information that I have seen thus far. I love a cup of coffee and a glass of wine daily but I am giving up the coffee and will do wine weekend only. Not sure what I will do for my wake up drink in the mornings since caffeine is a no go lol. In regard to foods are you saying anything with pH of 5 or above best? I can’t afford to buy the wipeout diet. I will have to try the basic alkaline diet etc. Are bananas and melons the only fruit? I understand all I have read just not sure I will have the knowledge to put meals together best for me. My main symptoms are burning throat and lots of little burps. That being said which one of the three sphincters do you think is my problem. Thank you for your research and this very informative guide. Blessings to you! Yeah ideally you want to only eat/drink things above a pH of 5. In terms of fruits there are a selection that meet that criteria just like melons and bananas as you mentioned, a couple others that comes to mind are papaya and dragon fruit though there are more yes. As for the root cause of why is it happening – it is quite impossible to say without more information and tests though the most likely cause is the LES I would guess. I forgot to ask what does Chamomile and Marshmallow Root Tea taste like? Do you drink them as is or mix anything in with them? Both of them are quite subtle and smooth tasting. I personally mostly drink them on their own though I occasionally add a half spoonful of honey into chamomile for a little sweetness. Hi David! Thanks for this comprehensive guide. Very informative. I was recently diagnosed with LPR. I first tried to tackle the problem with Zantac and that did nothing for me. Then the ENT started me on a PPI 2x a day. I’ve been on the PPI for one month AND doing the AWD diet noted above. I’ve seen some improvements and believe the diet is a big reason while the PPI is giving my throat time to heal. My goal is to get off the PPI and follow the diet. Many docs have told me that the healing is at least a 6-12 month journey and diet is a must for long term management. I am remaining positive but this has certainly been a roller coaster ride. My question to you – have you experienced sinus issues with your reflux? I’ve noticed that if I have a flare up, it immediately triggers my nose to gets stuffy and I experience clicking in the ears. I have also experienced headaches. Any tips to manage this? You are most welcome Dawn. I think you are already on the right track with the diet. As you said, I would advise getting of the PPI’s and instead you could replace it with Gaviscon Advance as I mentioned which will be more effective at helping your symptoms. As for your sinus issues yes I have experienced it myself and with my ears also. The best thing you can do is the diet and take the Gaviscon advance that is what I would advise and this in turn should lessen if not completely stop your symptoms. Best of luck! I’ve just stumbled upon your page, it’s really great – thank you for all this information. I have been suffering with sore throat, horse voice, and sometimes the taste of acid coming up. My doctor put me on PPIs and I took 40mg for three weeks, I felt my throat was better but still experienced the acid coming up. I think I may have LPR as food seems to come up even though I am following the acid watcher diet. It seems to come up when I eat my main meal and also when I have porridge. I’m finding it really hard to make the lifestyle changes though, I don’t have the time to make lots of small meals and just want to get my dinner with my family and have a normal sized portion! The biggest one for me is wine, I miss socialising with friends. Do you think it can be managed to have wine every so often if you follow a fairly strict diet the majority of the time? Everything I have read says avoid alcohol and chocolate, but I feel for most, this is unrealistic to never have these things. Thank you for the thoughtful information. I just began suffering from some of the symptoms of LPR. However, I do have stomach pain, upper abdominal pain and chest/back pains at different times. My doctor has said that I have GERDS with possible LPR symptoms. ENT told me that I may have LPR but inconclusive. I suppose my question, will following your diet plan assist with both? Would using a PPI and following the diet be an issue? To answer your questions yes my diet plan with absolutely help with both GERD and LPR. If you have both GERD and LPR symptoms I think taking a PPI and following the diet plan should be absolutely fine. PPI’s don’t usually help with LPR though they are effective for GERD symptoms so I think for you that is a good choice. Hope this helps Gino. Hi David, thank you so much for your article! It’s amazing and gives me hope. I started having acid reflux with red/burning throat and acid taste in my mouth 6 days after I had endoscopy. Have you heard that being a cause of LPR? I didn’t have anesthesia and was very nervous and had some retching to do during 4 min of EGD. My GI doctor said that it’s impossible for me to develop it. But how else can I explain it if I never had it in my life before? My other question: how long does it take appr with strict diet and supplements to heal LPR? Thank you so much! I haven’t heard of an endoscopy causing LPR before no, but it could even of been because of the bad nerves you had before having it done potentially. As for following a diet plan like the wipeout diet plan most people usually start to see improvements in under 2 weeks but for others it can take a little longer. It is all dependant on each person and there is not a simple answer that works for everyone. Thank you for your excellent web site. It really is extremely helpful. I have just one question. How long does it take for the symptoms to start to improve with the diet? I am planning to start removing things from my diet soon, and I am wondering how soon I can expect an improvement. You are most welcome. To see an improvement you should follow a diet plan like the wipeout diet plan. Assuming you follow a diet plan like it most people see improvements in under 2 weeks time. Thanks, David, that’s most helpful. Reading this has really helped me. I have been taking omneprazle which hasn’t helped much but now I know why. Will follow the diet you suggested and here’s hoping. Many thanks. Hi David, thanks for your info.It is very extensive and informative. Like you my LPR has been misdiagnosed by ENT, GP and Gastroenteroligist. I have questioned for many years why I keep having to clear my throat, keep getting post nasal drip and hoarse voice. Hundreds of dollars and time wasted going back and forth to doctors, taking PPI’s. I believe LPR has occurred in contracting Heliobactor Pylori. They tell me that many, many people have it and don’t even know. Lots of children have it and most people can just live with it or some can not. It is very difficult to erradicate. I have been on three courses of antibiotics and now await a forth very strong batch of specialised antibiotic to arrive from overseas which needs to be approved by the government to enter the country (sounds ominous)! I would recommend that LPR suffers get tested for Heliobactor too as the two go hand in hand. Heliobactor is a bacteria that lives in your stomach lining. It causes reflux or silent reflux and heartburn which eventually cause LPR.